Caramel stuffed into a brownie cookie!??? C’mon!!! I am definitely in cookie mode lately! 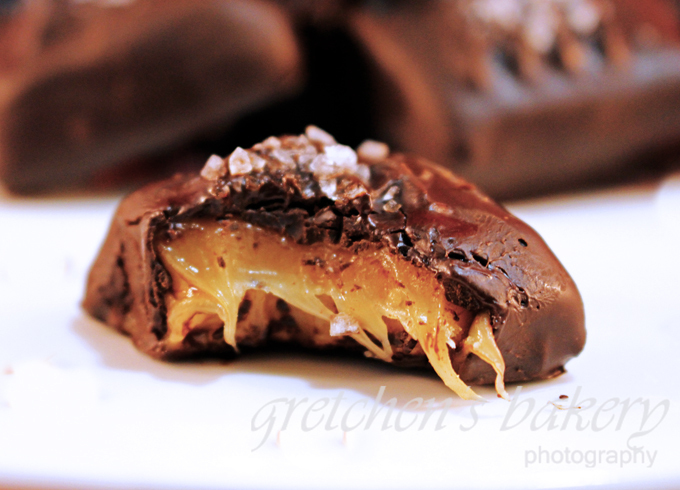 Probably because here in the USA we are full into Girl Scout season, so recently I made a couple Copy Cat Recipes for my favorite Girl Scout Samoas, Peanut Butter Patties and then I made Thin Mints too! So I am rolling with that cookie theme and decided to replicate of my most favorite cookies from my non vegan days, Caramel Volcano Cookies! 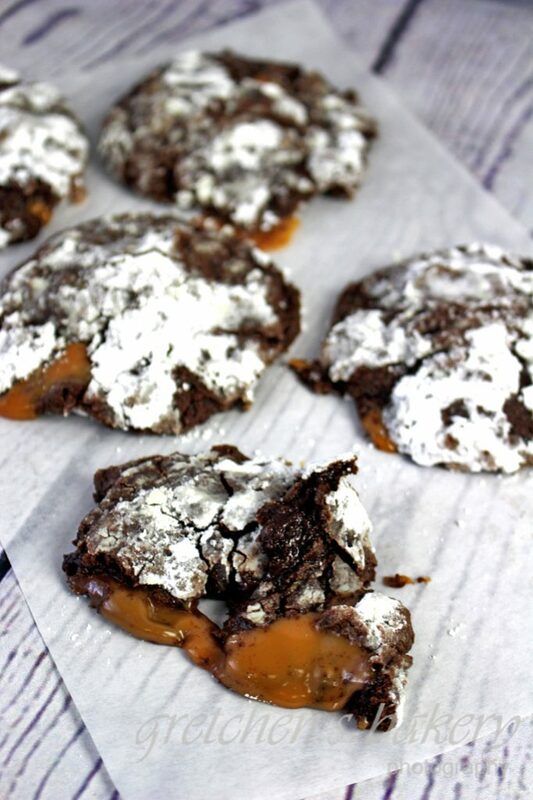 It’s almost like a brownie and a cookie all in one, with a homemade caramel candy in the center! Once they come out of the oven they are ooey, gooey & chocolate-y just how I love my cookies to be! Her recipes are always a hit and her instructions are so clear and concise that you just cannot fail! 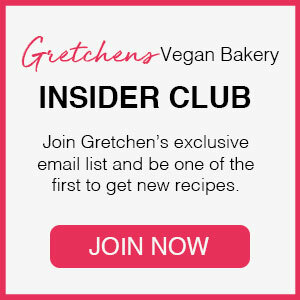 She is completely gluten free so if you need help in vegan + gluten free baking be sure to check her out, her blog is really awesome! 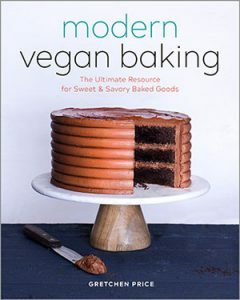 She is also the developer of the Plant Based Egg which has become my egg replacer of choice for just about 90% of my recipes now! Be sure to check that out as well! Ok now for the recipe! *Oh by the way if you really don’t want to go to all the trouble of making your own caramel candies (it is a hefty project all by itself I ain’t gonna lie…) you can buy vegan caramels instead and cut out much of the time involved in this recipe! 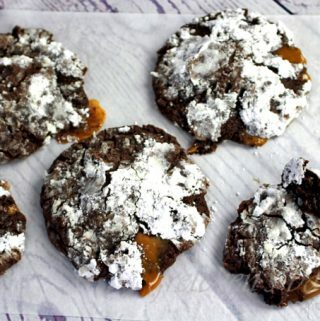 You will notice in the video I had my caramels dipped in chocolate since I made her recipe for the candies from start to finish; and only afterward did I have the “aha moment” to recreate these caramel volcano cookies! So the dipping of the caramels into the chocolate is not necessary for this cookie, but whoever complained about extra chocolate!? It will not affect the recipe either way you decide! I am using the Plant Based Egg Egg replacer by Freely Vegan (as I have been for most of my recipes lately) I think it is the best but if you do not want to buy it or cannot get it, you may use another proprietary blend instead, however I have not tested it with another egg replacer, so results may vary slightly. In a large mixing bowl combine granulated sugar, vanilla extract and cold coffee, whisk smooth. Add flour, egg replacer and baking powder, mix just until combined. can you use another egg replacer? the one included in this recipe doesn’t ship outside of the united states. Hi Rose, “I am using the Plant Based Egg Egg replacer by Freely Vegan (as I have been for most of my recipes lately) I think it is the best but if you do not want to buy it or cannot get it, you may use another proprietary blend instead, however I have not tested it with another egg replacer, so results may vary slightly. Hi Ada, I do not do gluten free baking, and from what I understand (and have experienced) it is not a simple 1:1 substitute. I can however direct you to my friend Deborah at Vegan Kitchen Magick she does all gluten free + vegan and her recipes are amazing, not to mention she has a recipe for a gluten free baking mix as well as a NEW ALL PURPOSE FLOUR blend that even I have been playing around with and it is wonderful – THAT will be going to market very soon! Stay tuned! and thankyou!! Hi Gretchen, I got your book few days ago. I love it! I just hope whatever I’ll bake will look as good as yours, maybe half as good. I love all your videos, you make everything look so easy. Aweee Thank you!!! I am sure it will be awesome! !